I didn’t even include the Ruddock report and beating up on LGBTIQ+ kiddies and teachers, because I think that was the prior week! Does this "big stick" fit into socialism, communism, opportunism, interventionism or democratic shittosphericism? Trust this guy who still believes that Noah saved all the animals in pairs (male and female), except the dinosaurs because they did not fit on his boat? Did the plant kingdom look after itself, or did Noah carry little seedlings as well? Is Scummo the reincarnation of an idiotic bully who still wants his mates to create more coal power stations (probably with subsidies from the Scummo government) with the hope they will come clean one day? Did he forget to mention the guilty poles and wires that were part of a grid reconstruction a while back? Is business going to kick him in the arse as he deserves for hindering profit making (the basis of capitalism) and basically claiming they cheat (gouge)? Is Scummo a big stick idiot? With nothing more than Farces and Grimaces to do. Of Prophesie, that the Government will be short-liv'd by ten. Based on Tom Brown (1633-1704) writings about dumb theatre audiences being led by "critics"... Here, voters are more astute. CRAP = Coal Ridiculous Absorbing Price. Tony Abbott and Malcolm Turnbull will both be condemned for squandering the mandate given to the Coalition in 2013 — Mr Abbott by breaking promises and bad decisions, Mr Turnbull by his flawed 2016 campaign. Even after all that's happened and regardless of Mr Morrison's own pragmatism, the Government remains in thrall to revenge and ideology, seemingly unable to rise above either. This is despite the obvious point that the only way of improving its fortunes is to do so. Saturday's Liberal disaster in Wentworth brought messages that are not being heeded. If anything, the by-election result has reinforced the old schisms. Scummo isn't a fireman who arrived too late... He is a small backyard dumb bozo bogan who threw another "Embassy to Jerusalem" on the barbie, like an idiot adds more lighting fluid, once the BBQ fire is already going. The only thing that's going to happen is WHOOSH!... and a few burnt fingers at best. 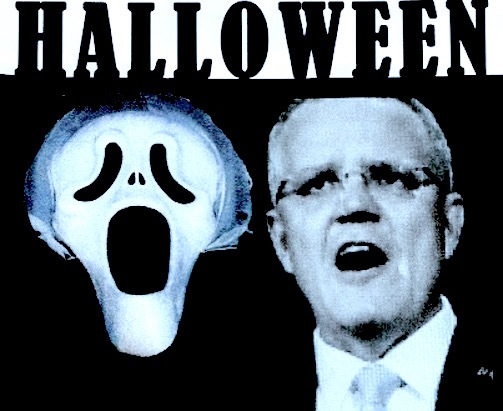 Some people think that Scott Morrison has been so hopeless already – in his first 60 or so days − he could soon be rolled in yet another Liberal coup — perhaps to Julie Bishop. As hilarious as this might be, it seems unlikely. So far, the Liberals have only equalled the levels of instability they crowed incessantly about during the “Rudd-Gillard-Rudd” years. Yet another prime minister would totally destroy any of their remaining shreds of credibility and almost certainly cause total electoral annihilation. Then again, the Libs are not great strategists… so who knows? Still, it seems unlikely. No, more likely, shouty Scott Morrison will continue trying to crab walk away from all the poisonous policies he previously espoused. He will keep disgorging stupidity – such as moving the Israeli embassy and on expelling gay kids from schools – before running away from these statements the very next day. The Coalition infighting will become more outfighting. The polls will slip even further – and they are already behind in every state in Newspoll – and voters will hammer nails into their baseball bats while they wait expectantly. So much for the Tories, but what about Labor? What will they do before the next election? The answer to this is not much. They will release a few policies. Chase after the endless incompetence and controversies of the Coalition – and just the Great Barrier Reef Foundation, Stuart Robert and Melissa Price would enough to keep them busy for years – but mostly will keep a low profile and watch on contentedly as the Coalition burns itself down to ashes. At this stage, Bill Shorten could be filmed kicking cute little puppies and Labor would still win the next election. But there is a more interesting question. Namely, what will the Murdoch media do now it realises a Labor victory in inevitable? Gus: ...Good question: what will the Murdoch media do now it realises a Labor victory in inevitable? 23 hours ago - How the member for Wentworth Kerryn Phelps made her fortune. John Rolfe, News Corp Australia Network. October 25, 2018 4:00am. Come on merde-och sewer pump! Dr Phelps is an INTELLIGENT person. She is possibly one of the most intelligent member of the Australian Parliament ever to come on the scene — albeit "accidentally"... while Scummo still believes in Noah's Ark! Morrison was ad-Libbing about the children on Nauru because he thought it might help his candidate in the Wentworth by-election. Interestingly, the overwhelming majority of Australians support the New Zealand offer. It makes electoral, as well as some sort of warped moral sense, to pursue this and deliver an outcome the majority support. Morrison backing away from that solution shows how out of touch he is — and what a liar he is. The Prime Minister has consistently refused to discuss the cause of the drought — climate change. He did not ad-Lib during the by-election about climate change, despite this being, along with refugees, a major issue for voters in Wentworth. This is because capitalism is built on greenhouse gas emissions and the mining industry has major sway within the Coalition and sections of the population. That is why Morrison’s mantra is about lower prices and reliability — both of which are achievable not with coal but renewable energy, batteries and spending to modernise electricity supply networks. When Morrison and the rest of his Government tell us that they are going to drive prices down, be very sceptical. Interestingly, the Coalition is proposing to reduce retail electricity prices by heavy-handed Government intervention. For example, there will be a price safety net, including a default price set by the Australian Energy Regulator. Is this price simply control by another name? The Government will also force energy companies to sign contracts to guarantee supply. Meanwhile, there are over 100,000 homeless people in Australia, three million Australians live in poverty (including almost 700,000 kids), many Aboriginal people live in third world conditions with third world diseases, kids are imprisoned on Nauru, wages have stalled and underemployment is growing. On top of all that, climate change poses an existential threat to the planet.